We humans spend most of our waking lives working. Work includes cultural, intellectual, managerial, and emotional labor as well as physical toil. Despite this, most work by humanities and media scholars implicitly treats the study of work as marginal or uninteresting. Even the study of “digital practices” rarely engages with the specifics of the workplace, despite the importance of distributed micro-practices like clickworking. Information technology underpins the transformation of work today, as it has it in the past. 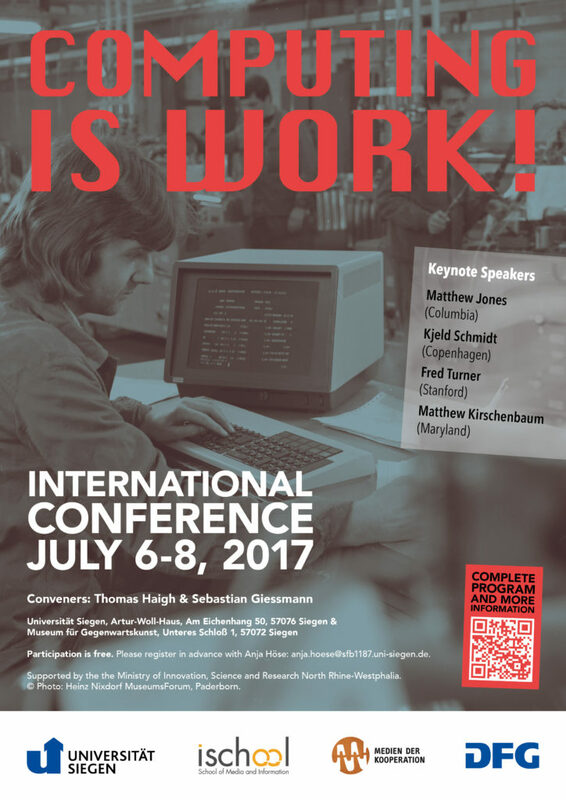 We welcome interdisciplinary contributions that address computing as work practice, both on a local, situated, infrastructural level. Speakers will be exploring many kinds of work, from the work of computerized literary production to the work of scientific research.We believe that close attention to the social processes of work has the cross-cutting potential to integrate a variety of historical, social and ethnographic research approaches, from labor history to the scientific ethnography to the study of media practices as cooperative accomplishments, into a revealing whole. Supported by the Siegen University iSchool, the Collaborative Research Centre “Media of Cooperation”, Siegen and the Ministry of Innovation, Science and Research North Rhine-Westphalia.